Columbia is a well -known example of the New Town Movement in the United States. It shares similarities with Reston, VA, Woodlands, TX, Irvine, CA and others. But it stands out in its innovative approach to planning that included a 6-month period of inter-disciplinary meetings bringing together experts in fields as diverse as education, recreation, sociology, transportation, and religion as well as architects and engineers. Columbia is also unique for its purposeful goal to be an integrated community at a time before the Fair Housing Act of 1968 made it illegal to discriminate in housing based on race, color, national origin or religion. 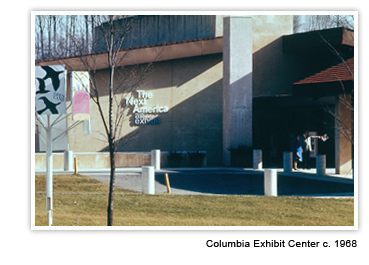 The Exhibit Center that opened in 1967 depicted the Story of Columbia in an exhibit titled “The Next America.” It was the pronouncement of the vision for a better city: a blend of the best of city and country living providing answers to problems arising from crowding in major cities and unmet needs in suburbs. Almost 50 years later Columbia is a thriving, unincorporated city of nearly 100,000 people that is by many measures one of the most successful models of new town development and a highly desirable place to live. Columbia was developed by Howard Research and Development (HRD), a subsidiary of The Rouse Company, led by its founder James Rouse. It grew out of Rouse’s belief that private developers could plan and build an environment that nurtured the growth of people. In 1961 Rouse consulted with members of the Rockefeller family on a potential community on land they owned in Pocantico Hills, New York. The project was abandoned, but the ideas led to more concrete thinking about building a city and were realized in Cross Keys, a small, mixed-use community in Baltimore. By 1962 planning for Cross Keys was in full swing, and Rouse was looking ahead to something bigger – a large enough area to build a real city. A top criteria for a site was a location between two metropolitan areas. There were several options, including land in the Baltimore-based company’s backyard in Howard County, Maryland, located midway between Washington DC and Baltimore, one of the fastest-growing regions in the country. The purchase of 1039 acres in November 1962 started a fast-paced, necessarily secretive, land acquisition. On October 30, 1963 Rouse announced to Howard County officials and residents that his company had acquired 14,000 acres and planned to build a city. In November 1962, about the same time as the first land purchase, Rouse hired William E. Finley to head the planning and development of the new town. Finley had been director of the National Capital Planning Commission (NCPC) in Washington, DC that had just issued its report for the future of the region. Finley, in turn, hired the chief designer at NCPC, Mort Hoppenfeld, to be chief planner for Columbia. The first step to the success of Columbia was the arrangement with Connecticut General Life Insurance Company. Under the leadership of Frazar Wilde, Connecticut General invested $23 million and Howard Research and Development, a partnership with The Rouse Company, was formed to develop the new city. Rouse acknowledged the importance of this commitment in the ceremonies dedicating Wilde Lake. The second step was the innovative approach to planning. A month before the October 30, 1963 announcement of the land acquisition and intention to build a city, Rouse delivered a speech at the Conference on the Metropolitan Future at the University of California at Berkeley (click here to download speech or listen to audio). He had been asked to deliver a keynote address at this conference which was one in a series on California and the Challenge of Growth. No one outside of Rouse’s inner circle knew about the plan to build a city. Rouse has said that it was provident that he was asked to speak: it made him focus on the task ahead. The speech outlined his philosophy that would soon form the basis of the Columbia planning process. Detailed planning for the new city proceeded from October 1963 to November 1964 with a team that became known as the Work Group. Rouse recruited nationally known experts in a wide array of disciplines to look at the possibilities – the optimum way to develop a community that would work best for the people who were to live there. This process produced a determination of the most vital social and institutional components of the new city and how they might best be reflected in a physical environment. On November 11, 1964, James Rouse made a formal presentation to officials of Howard County. Acomprehensive 51-page booklet set forth the goals and general ideas for how the city would be designed. It addressed zoning, land uses and density. It introduced the village and neighborhood concept, plans for business and industry, recreation and open space and the Town Center. In fact, the key physical part of the presentation was a model of a Town Center leaving no room for misunderstanding that the plan was for a city. In August 1965, Howard County granted “new town zoning” a code written by county planners and HRD, allowing the plan to go ahead. Construction began in June 1966. Lake Kittamaqundi and Wilde Lake were carved out of fields; ground was broken for the first commercial buildings in Town Center and the residential neighborhood of Bryant Woods. A year later, on June 21, 1967, Wilde Lake was dedicated marking the beginning of Columbia. The first residents began moving in to Bryant Gardens apartments and single-family homes on Rivulet Way and Catterskill Court. Today those elements are in place. Columbia has more than 36,000 residential units ranging from subsidized apartments to single family homes. There is a strong economic base with more than 91,000 jobs. As planned, there is panoply of institutions, organizations and private enterprises to serve the community including Howard County Library, Howard County General Hospital (part of the Johns Hopkins system), Howard Community College, performing arts spaces, movie theaters, restaurants, hotels, and retail options. As an unincorporated city it is governed by Howard County but at its core is the Columbia Association which manages many of the services and amenities. Columbia has achieved economic, racial and ethnic diversity. Three Interfaith Centers housing multiple congregations plus more than 41 other congregations reflect the multi-faith population. This belief led to open space integrated into the community rather than having a greenbelt around the developed areas. It led to the creation of three man-made lakes, an extensive path system, playgrounds and parks and dedicated natural areas allowing habitats for birds, waterfowl and other animals. Columbia Association owns and maintains the open space ensuring that people do have the opportunity to experience nature. 4. To make a profit. It was important to The Rouse Company to demonstrate that good development could also be good for the developer. It took a long time, but Columbia proved to be profitable for the developer. In 1985 HRD purchased Connecticut General’s share of HRD and substantial earnings from the development of Columbia began to be realized in 1986. In 2004 General Growth Properties (GGP) purchased The Rouse Company in a deal valued at $12.6 billion. The Columbia portfolio has subsequently become a part of Howard Hughes Corporation. It is generally agreed that Columbia has met its four goals and is considered a success by those who live here and those who study planned communities. Columbia will celebrate its 50th birthday in 2017. When Columbia started and was first touted as The Next America there was the promise of a city that would grow and lead the way to better places to live. While it basks in its success, Columbia still faces some challenges to keep it moving in a forward direction. One is the development of a true Town Center. In 2004 Howard County began a process to develop a master plan for Town Center. A charrette in 2005, followed by much study and planning by Howard County Planning and Zoning, General Growth Properties and later Howard Hughes Corporation concluded in the passage of the General Plan Amendment in 2010. This document created the guidelines for the development of the Town Center for the next 20 to 30 years. It allows for up to 13 million square feet of mixed-use development, including up to 5,500 residential units, one million square feet of retail, five million square feet of office space and 640 hotel rooms. There are many efforts underway. Whole Foods and Haven on the Lake, a Columbia Association wellness center, opened in 2014 in the former headquarters building of The Rouse Co. (a building designed by renowned architect Frank Gehry). The Metropolitan apartments in Town Center opened in 2015. A multi-use pathway linking Howard County General Hospital to the Town Center Lakefront is under development. The Inner Arbor Trust will open the Chrysalis, a permanent outdoor stage in 2016 as the first phase of the revitalization of Symphony Woods, the park in the center of Town Center. Merriweather Post Pavilion, Columbia’s signature music venue, will open the 2016 season with a new stage and other major improvements and transfer of ownership from Howard Hughes Corporation to the Downtown Columbia Arts and Culture Commission is on the horizon. When Wilde Lake was dedicated in 1967 James Rouse remarked that he hoped Columbia would never be finished, that the community would continue to develop and that the residents who would come to call Columbia home would be actively engaged in the process. That has proven to be true and the history of Columbia is an ongoing story. Hobbit’s Glen conjures up images of the adventures of Bilbo and Frodo Baggins — and it’s fitting, then, that the streets in the Columbia neighborhood are almost all taken from J.R.R. Tolkien’s famed fantasy tales. Meanwhile, every street name in the neighborhood of Longfellow comes, fittingly, from the poems of William Wadsworth Longfellow, while the works of 20th century painter Andrew Wyeth have been repurposed for the street names in Thunder Hill. These are just a few examples of how the road names in Columbia are, well, different. They can bring a smile or raise an eyebrow. And they all have stories behind them, with an overwhelming majority having origins in artwork, fiction, poetry and the history of the land that predated Columbia. Oh, You Must Live in Columbia! The Origins of Place Names in Columbia, Maryland details the sources of Columbia’s road, village and neighborhood names and how they were chosen. It was compiled by Columbia Archives, keeper of Columbia’s history, authored by manager Barbara Kellner, archivist Robin Emrich and contributing writer Missy Burke. Oh, You Must Live in Columbia ($25) is available from the Archives, 6310 Hillside Court, Columbia, 21046. For more information, email Columbia.Archives@ColumbiaAssociation.org, call 410-715-3103 or visit Monday-Friday from 9am-5pm. Appointments are encouraged. Columbia Archives , which collects and preserves the history of Columbia, is located in CA Headquarters at 6310 Hillside Court, off Stevens Forest Road. It is open Monday through Friday from 9am-5pm. The collection covers the planning and development of Columbia as well as the extensive James Rouse Collection, which chronicles Rouse’s long career that influenced urban and suburban development in the United States and around the world. It is rich with correspondence, speeches, photographs and memorabilia. The public is welcome to visit and spend time researching to get a deeper understanding of the history of Columbia. Appointments are encouraged. For more information, email Columbia.Archives@ColumbiaAssociation.org or call 410-715-3103.